One in a weekly series of enthusiastic posts, contributed by HILOBROW friends and regulars, on the topic of our favorite comic books, comic strips, and graphic novels. By the time I started reading the disintegrating stack of Archie comics at my grandparents’ off-the-grid Vermont cabin, the references were already outdated. Archie Andrews was created by John Goldwater and Bob Montana in 1941 (though authorship, as in so many illustrated universes, is in some dispute) as an everyteen. Maybe my mother and her sisters, who bought most of the comics, had occupied that high school world. Hanover, New Hampshire, their hometown, still has a functioning soda shop within walking distance of Hanover High. But for me it was as distant as outer space … except for Betty. Betty Cooper was blonde like me. She had a ponytail like me. She was smart like me. Would I grow up to be a Betty? 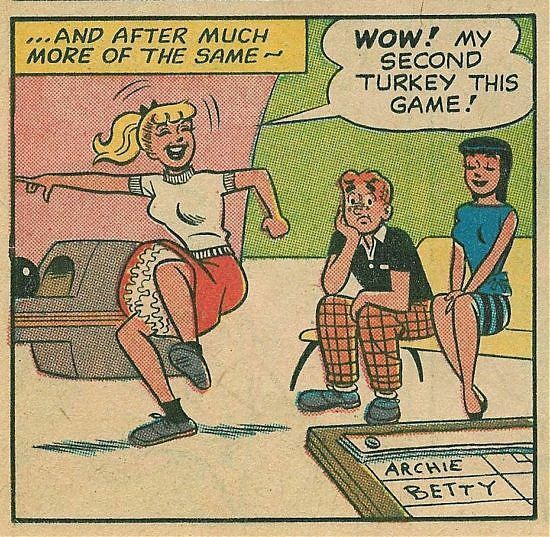 In Archie lore, people say our red-headed hero never decides between Betty, the girl next door, and Veronica, the rich brunette vamp, but that wasn’t my perception of events. In comic after comic, Veronica swoops in for the clinch. She needs Archie. She pays for Archie. She drives off into the sunset with Archie. And Betty is there, holding the socket wrench, grease on her snub nose, having fixed that car. Maybe over Archie Comics’ 77-year history Betty did, once or twice, get her man. I haven’t read them all and I suspect no human could. After a while, the hijinks become numbing. How many times can Archie fall into Veronica’s pool? I was interviewed for this 99 Percent Invisible episode on the kindergarten toys designed by Friedrich Froebel … the reason children play with wooden blocks today. In the late 1700s, a young man named Freidrich Froebel was on track to become an architect when a friend convinced him to pursue a path toward education instead. 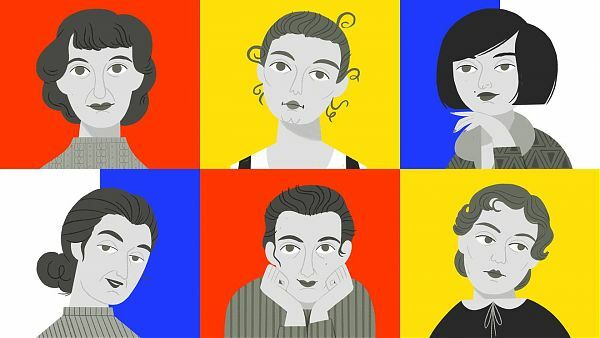 And in changing course, Froebel arguably ended up having more influence on the world of architecture and design than any single architect — all because Friedrich Froebel created kindergarten. If you’ve ever looked at a piece of abstract art or Modernist architecture and thought “my kindergartener could have made that,” well, that may be more true than you realize. Atelier Peter Zumthor & Partners / The Boundary via Building LACMA. In 2013, a new proposal for LACMA by Peter Zumthor, a Pritzker-winning Swiss architect who has no public projects in the U.S., showed a jet-black blob on the north side of Wilshire that seemed to ooze between the adjacent La Brea Tar Pits and the Renzo Piano-designed Broad Contemporary Art Museum. 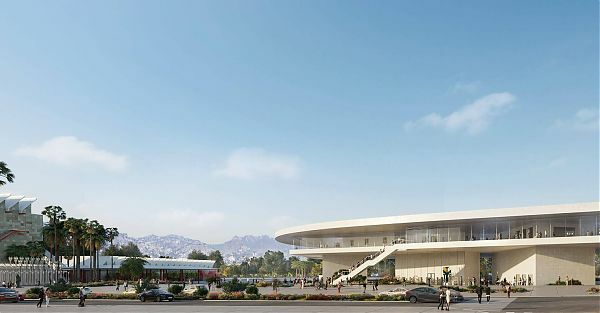 But environmental and spatial concerns forced Zumthor to revisit that design—which had been dubbed “the Inkblot.” Black became beige, due to heat-island concerns, and the blob moved away from the tar pits and across the boulevard, where it now touches down in a museum-owned parking lot. Between 2017 and 2019, the design changed yet again. LACMA director Michael Govan defended Zumthor’s new design in both a weekend interview and an op-ed at the Los Angeles Times. But Curbed’s urbanism editor Alissa Walker and architecture critic Alexandra Lange took a stroll Friday around LACMA’s campus, and they are not convinced. What follows is their conversation about the role of museums in urban life, the controversy surrounding Zumthor’s design, and how the new LACMA must meet the street. Walter Gropius published the founding manifesto of the Bauhaus in Weimar in 1919. Both the Lyonel Feininger woodcut of a cathedral on the cover and the first line of the four-page leaflet exalted architecture: “The ultimate aim of all visual arts is the complete building!” he wrote. “Architects, painters, and sculptors must recognize anew and learn to grasp the composite character of a building both as an entity and as separate parts.” Gropius’s new school would reunite craftsmen and artists in the modern era, allowing them to work in tandem toward a common goal as they had building medieval cathedrals. But collaboration, and craft, didn’t mean an end to old hierarchies. If the ultimate goal was the building, then the architect (all of the directors of the Bauhaus were, in fact, architects) would sit on top of the design hierarchy. When we think of the Bauhaus today, the image is often still a building: the one Gropius designed for the second incarnation of the school, in Dessau. It is only as we look to the interiors of that building—to its lamps, to its curtains, and to the credits on the photographs of all of the above— that we can see the work of women. As Sigrid Wortmann Weltge writes in the introduction to her book Women’s Work: Textile Art from the Bauhaus, female students “arrived at the school with an astonishing diversity of talents, convinced that this avant-garde institution would accept them as equals.” Alas. 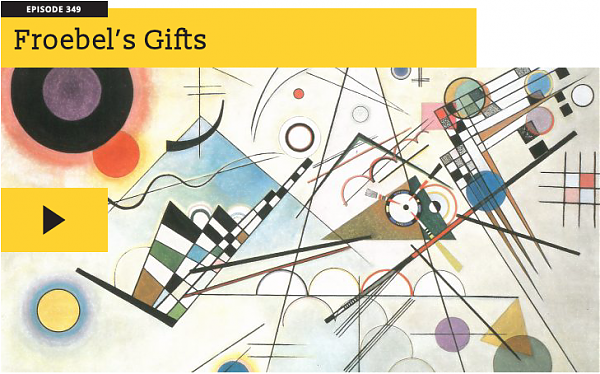 Many of these students had already studied art elsewhere—and they were eager to learn from masters like Paul Klee, Wassily Kandinsky, and László Moholy-Nagy—but “they were segregated and given their own workshop, the Weaving Workshop, regardless of talent or inclination,” Weltge writes. Photo by Max Touhey for Curbed. There is a spot, walking north on the High Line toward West 30th Street, where Hudson Yards looks almost all right. The Shed, wearing a pillowy parka made from weatherproof ETFE panels, slides in from the left. 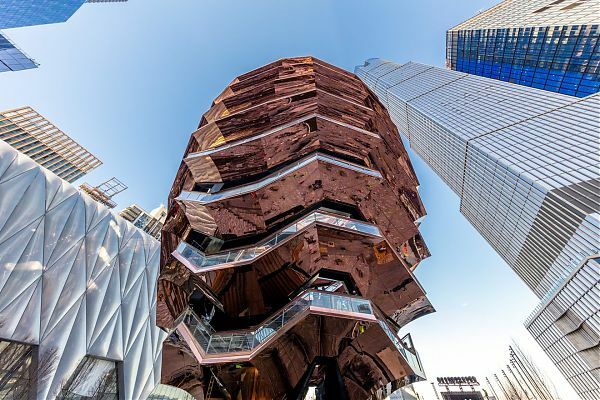 The transparent lobby of 10 Hudson Yards overlaps it from the right, and the copper bowl of Vessel sparkles in the winter sunlight. The towers rise beyond: black-and-blue 15 Hudson Yards farther west, tan-striped 35 Hudson Yards to the north. There’s a hint of variety even though every material is hard and neutral, every edge geometric. There are even a couple of curves. It looks like a real city. You’re coming off a curve yourself, as the High Line’s former rail trestle arcs, for the first time, out toward the river. Now there’s a new path open to the north, connecting you to the shops and the restaurants and the Equinox and the offices and the condos and the Instagrammable ball pits that live inside those muted grids. But as you keep walking, those pieces disengage from each other—one, two, three, four, five, six, seven objects standing on a super-engineered platform. No one thought to bring any crayons, much less softness, or texture, or water. Help will eventually arrive, in the form of 200 mature trees and 28,000 plants, as well as a 200-foot-long handmade wooden bench, specified by landscape architects Nelson Byrd Woltz. Opening at the tail end of New York winter is not kind to the landscape, but it is hard to believe the plants will be enough to mitigate the unrelenting angles of the new city-within-a-city. 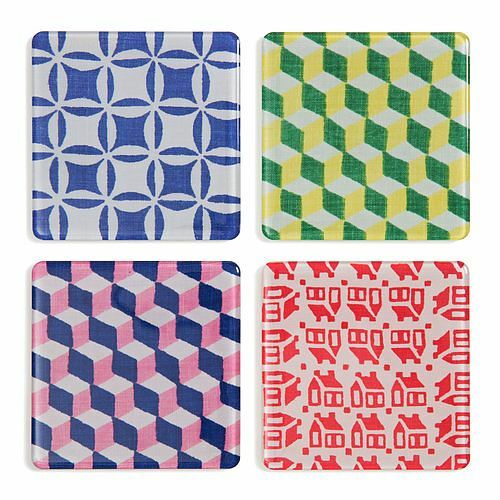 Marguerita Mergentime coasters, for sale at the Cooper Hewitt Shop. In 2000, Virginia Bayer went to an exhibition of 20th-century American women designers at the Bard Graduate Center in New York. She knew her grandmother Marguerita Mergentime (1894-1941) had designed curtains and carpets for Radio City Music Hall, had items exhibited at the Metropolitan and Brooklyn Museums, and sold her graphic table linens at stores like Lord & Taylor, B. Altman and Macy’s. But her work was nowhere to be found. In 2017 Ms. Bayer and two collaborators published “Marguerita Mergentime: American Textiles, Modern Ideas” (West Madison Press), ensuring her grandmother wouldn’t be forgotten again.